The life and death of each cell is strictly controlled to maintain "live" individual organisms. For example, while the cell death of the type called necrosis is observed in the case of the death of essential cells caused by various injuries, unnecessary cells are removed by cell death called apoptosis. It is known that various diseases such as a cancer, ischemia and neurodegenerative diseases are caused by abnormal mechanisms of cell death. Because of this, new types of therapies and prophylaxis can be expected by controlling cell death. For this purpose, it is important to understand the mechanism of cell death, especially the mechanism of necrosis on a molecular level, and to clarify the whole aspect. One part of this research aims at developing low molecular weight compounds which can control cell death, identifying the proteins relevant to cell death, and developing novel chemical techniques that can detect the relationship of these substances in live cells. The other part of this research is to solve the mechanism of cell death on a molecular level by examining the function of identified proteins. 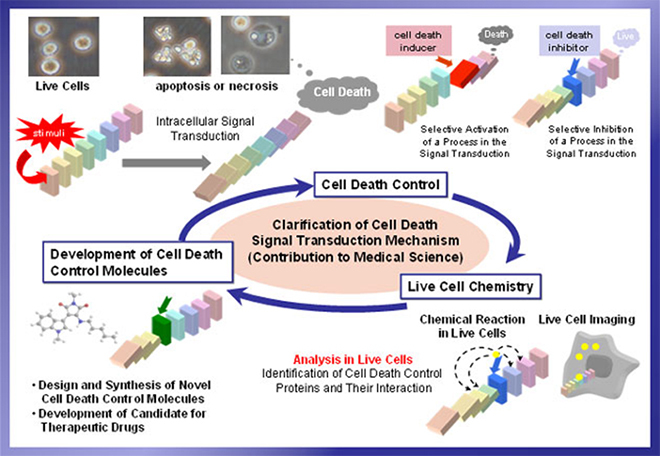 Furthermore, novel "cell death control molecules" and analytical skills, which are developed in the process of this investigation, are expected to be useful in producing curative medicine for diseases caused by the abnormalities in cell death, and clarifying other life processes.